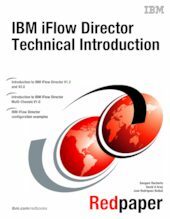 IBM® iFlow Director is a high performance, low-latency 10 Gb Ethernet switch integrated flow balancer with policy-based traffic steering capability. It delivers high-availability, scalability, and lower total cost of ownership (TCO) for appliance vendors that offer IBM BladeCenter® based solutions for applications, such as Security Gateways, Wireless Gateways, Lawful Interception & Network Surveillance, Traffic Management & Service Differentiation, and so on. The system throughput can be scaled by adding more blade servers and up to four switches that run iFlow Director. iFlow Director is designed with a number of advanced features to deliver high availability in mission-critical environments. The solution is built around industry-leading hardware to help eliminate any single point of failure. iFlow Director uses BladeCenter innovations such as internal monitoring, redundant mid-plane, redundant network connections per blade, redundant power supplies and fans, and switching features, such as uplink failure detection and controlled failover with network interface card (NIC) teaming, to deliver high availability. iFlow Director provides up to 480 Gbps of nonblocking, wire-speed bidirectional throughput to BladeCenter to meet your network traffic load distribution needs. With ten 10 Gbps uplink ports and 14 nonblocking 10 Gbps internal ports, iFlow Director offers unmatched performance, with latency as low as 1.60 microseconds. The iFlow Director solution provides significant savings compared to a solution that consists of multiple stand-alone appliances, Layer 2 switches and load balancers. With 480 Gbps of raw throughput, the iFlow Director solution provides a price/performance advantage. This IBM Redpaper™ publication is intended for network professionals who want to reduce the complexity associated with appliance sprawl by using a integrated solution that includes a high performance 10 Gb Ethernet embedded switch for BladeCenter, and a stack of software that allows the control of the flow of traffic inside the chassis.